Last week we covered all the work we’d done to our long-term tester to get her ready for some dirty action. 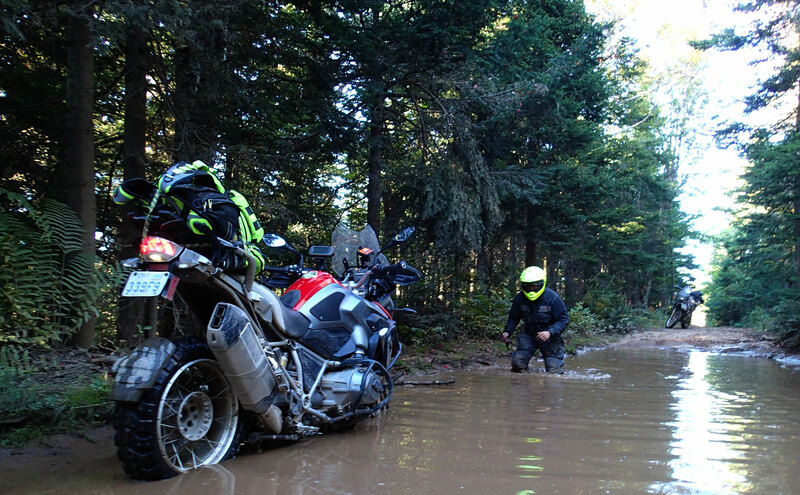 Aware that the Heidenau Scout rear tire would be the main limiting factor, I invited along some cannon fodder, err, pals to ride with me into the mud and muck. 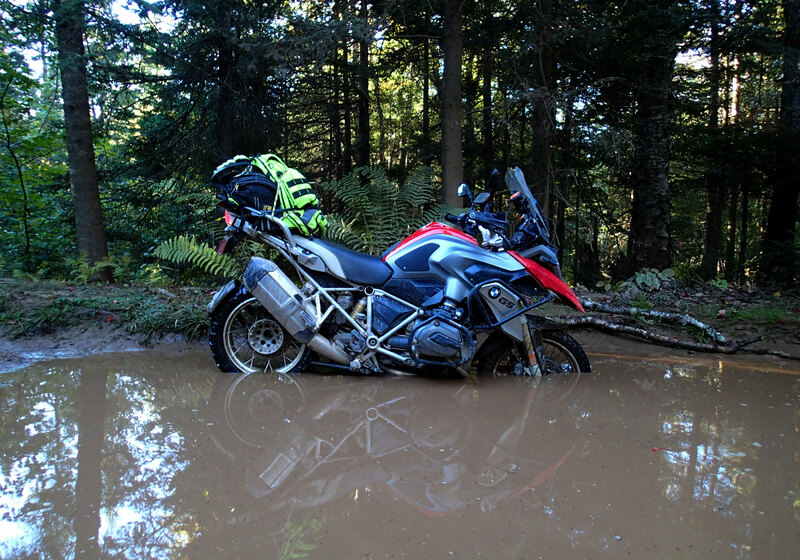 News Editor Zac Kurylyk on the long-term Honda CRF250L and pal Charles Landry on his trusty KLR650 were on hand to throw themselves first into muddy hole and bottomless pits, ensuring that the GS would not suffer any dignitaries best reserved for the peasant class. Let them eat cake I say. And some mud too. There’s something both utterly glorious and at the same time, utterly terrifying when first launching the big GS into the world of gravel, rocks and mud. I’d beefed up the protection to make it more battle ready, and a summer of asphalt riding had familiarized myself with the GS, but taking that fat power/chassis into a world of minimal traction was a combination that I wasn’t sure I could trust myself with. It’s one thing to be hauling down a stretch of perfect asphalt, but completely another to be in the woods of rural New Brunswick doing the same thing on gravel. Simply put, it’s a whole lotta motorcycle/power to have go sideways on you – both figuratively and literally. Frankly, the GS off-road, in incompetent hands is a dangerous machine. I’m sorry to say that my first forray into the woods, was laced with a splash of incompetence. I paddled my way through a water crossing like a clumsy oaf and every time I whacked open the throttle the intended graceful fishtail was a violent thrash. My first foray with the GS was not a thing of beauty. So I went back to basics and spent time on simple gravel roads nearer home, getting used to how the beast reacts to throttle, brake and turning. It was time well spent. The very same qualities that had so confounded me the previous outing were now a joy to behold. Size and weight can be a majestic combination in the right hands – where the CRF250L CMG long-termer would hop and bounce over irregularities, the GS would simply glide over them. And then there’s that power. Wide and forceful, the new liquid-cooled boxer motor is a lazy man’s dream – big power from zero to eleven and as linear in its delivery as a prairie highway. Then I discovered Enduro Pro ride mode. It is not available until you insert a special plug (provided) into the wiring harness under the seat. The process makes it a little daunting, but there is no unleashing of turbo power, merely the removal of some of the rider assistance devices. Gone is ABS on the rear wheel, and traction control is severely curtailed. Power is pepped up a tad from the regular Enduro mode, but then not the full whack of Dynamic that to my liking is a little too keen off throttle for gravel. Now, the Heidenau rear’s limitations suddenly became a bit of an asset (especially if pumped up to road pressure). The hard compound, solid treaded centre of the rear meant that it could be spun up easily, even at speed. The result is an almost gliding-like experience as the rear skims over the ground and the sheer mass of the GS keeps a smooth rider experience despite the irregularities trying to rattle the machine from below. Simply put, it is glorious. 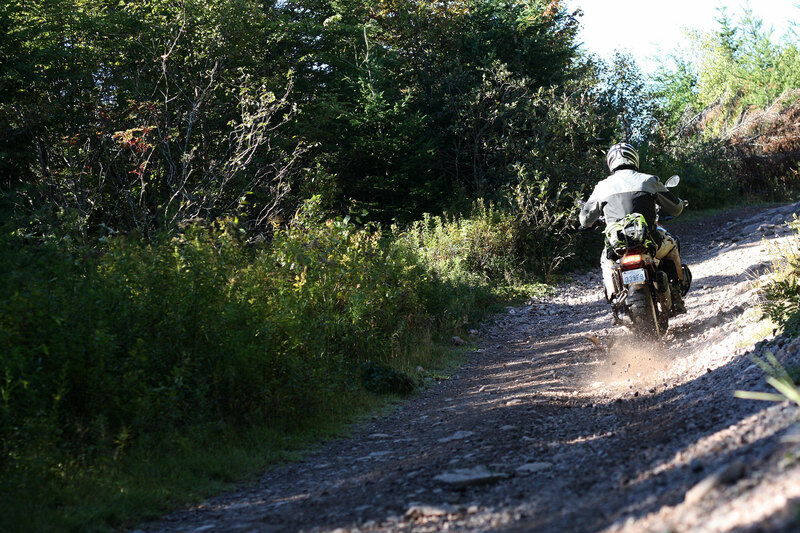 I also put into play a bit of advice I garnered from Ontario-based bike instructor Clinton Smout at the recent Fundy Adventure Rally – use the front brake! Front brakes on gravel is a bit of a leap of faith, the lack of traction means that the tire will start to slide a lot quicker than on asphalt and a sliding front is not good news for those who like to keep the rubber side down. But even in Enduro Pro, the big GS keeps ABS fully operational up front, and although it does allow for a little more slip than in road mode, it is astonishing just how much you can haul on the brake before the ABS kicks in. It took a while to trust the front end, but pretty soon I had given up on the rear brake and was stopping in a much more controlled and shorter manner. 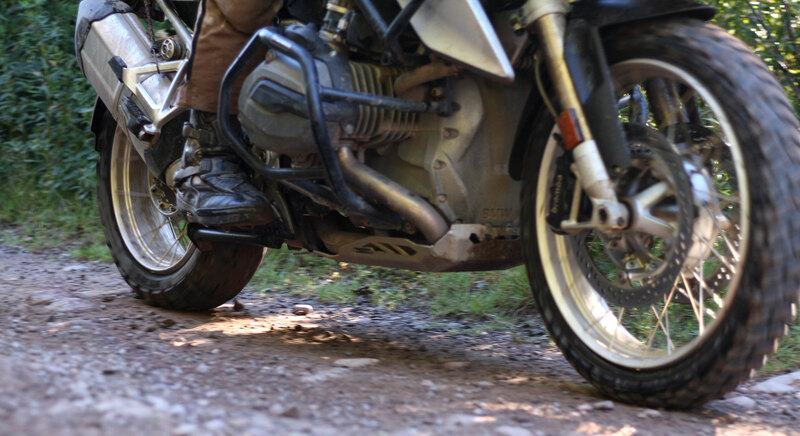 Of course, what made the GS a whole lotta fun in gravel, did not translate necessarily to the rougher stuff. I was pleasantly surprised by the amount of ground clearance, only grazing the bash plate once on an exposed drainage pipe and hearing the clank of rocks when the terrain was obviously tough. Basically, if I felt it should be fine it was, and if I thought I was now going a bit above and beyond, I just had to slow down and pick my course through. Water crossings were sadly limited by the Heidenau that would slip around in the wet no matter what lay beneath. Of course, mud holes were the bigger challenge, but that is what Privates Kurylyk and Landry were there for, though inevitably since Zac was there to do camera shooting, Charles was sent forth more often than not. Case and point was a section of scouting with a big chunk of asphalt and we were gagging for some more adventure when we saw a trail arc off the pavement and follow alongside a river. It was a little like the pictures you see of Mongolia – open grassland with many tracks finding their own way from here to there. Which was the best option was all part of the puzzle – some disappearing into muddy holes, others snaking their way around. 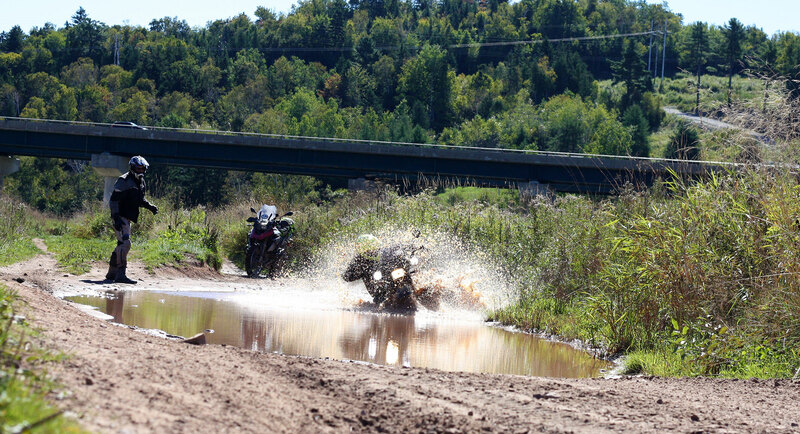 We came to the first impressive mud hole and decided that it would make a fine shot of the BMW ploughing through. Ok, send in the peasants! Zac was already set up, camera to face so Charles got the short straw and surprisingly took a little run up to the hole. 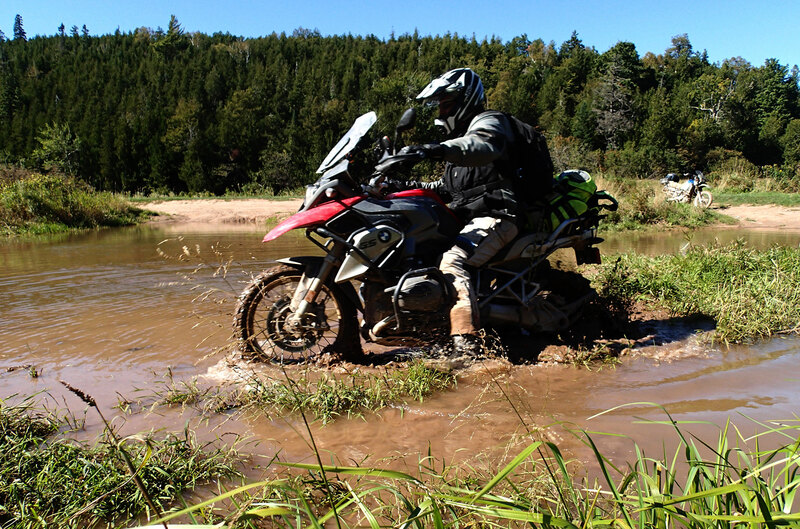 “Splooosh”, the wave of water was impressive, but not as impressive as a KLR suddenly sinking deeply before throwing its rider unceremoniously into the chocolate brown water. Your initial reaction is to get in there and ensure the guy is not hurt (he wasn’t, but his leg was pinned under the KLR). The second is to shout over to the camera guy and ask him if he got the shot. Or was it the other way around? Regardless, I opted not to follow through with the GS, and the exploration of the area ended when the trail forded the river. Zac crossed and explored the other side, coming back to say how good it was … on a CRF250L. Needless to say, for me, the side excursion was done. The day was drawing on and as we skimmed close to Chez Kurylyk, Zac peeled off, catching a side trail on his way that would see him find his own adventures. 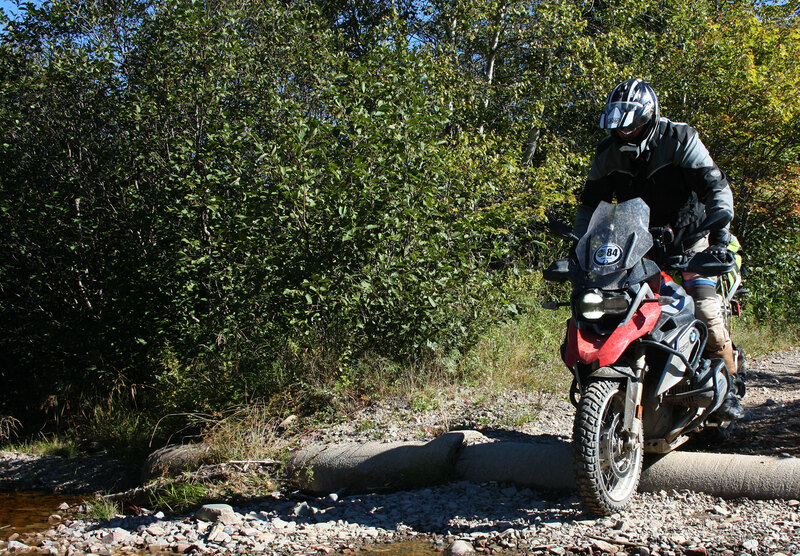 Charles and I motored back to his camp, opting to follow what appeared to be some easy gravel roads on the map. Hahaha, sadly off-road maps do not offer any clue as to the actual state of a trail. The same thickness of black line can, and has turned out to be a gravel highway capable of 160 km/h speeds, or a muddy, boggy, ‘orrible mess that you’re lucky just to get out of. 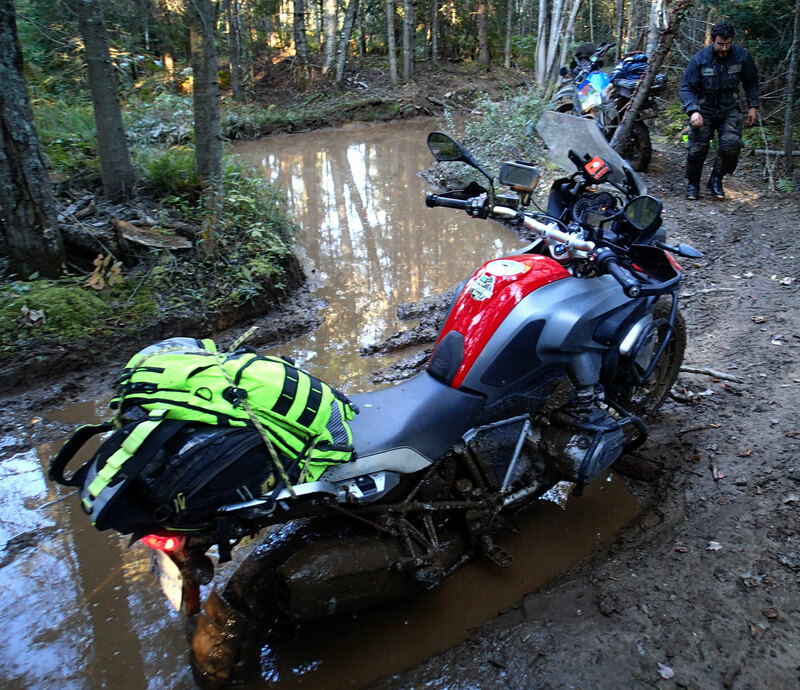 It did, however, provide the missing piece of the off-road testing plan for the GS. The trail started out as a postcard perfect narrow affair, picking its way through deciduous woodland. It was like a scene out of a fairy tale, complete with a villainous mud hole a few Kms in. As usual, Charles was sent ahead. This time there was no run up, just a slow dropping of the front wheel into said hole. It had a surprising depth but he went through smoothly indicating a firm and level bottom (the mud hole, not Charles). Ok, the GS shall pass. Taking the lead was not my smartest decision. This became the theme of the trail, each time Charles found the way through and GS followed, until I started to feel a little guilty. A rare emotion for me, I oddly opted to accommodate it and at the next mud hole I volunteered to go first. Whoomph. It was like riding into a ditch and I stopped it right there, bike looking straight down into the murk, mud grasping the front wheel sufficiently that I just got off and left it there. Luckily I had a Charles at my disposal. I’ve been here enough times to know that you now have to back out — going forward offers only more pain — and the two of us proceeded to pull the mother out. We finally cleared the trail as it opened out into a clear cut, earth bare and deeply gouged by the monster machinery that had consumed all the trees. With the sun about to drop below the horizon, things were in need of a rethink. Charles, being the fearless trooper he is, opted to ride ahead and see if there was a way out, while I sat with the GS and pondered the potential of having to ride back out through all the crap we’d just conquered. It’s a sobering thought but one that I didn’t have to think about for long as Charles soon reappeared, ensuring me that although rough, most importantly it was ‘GSable’. 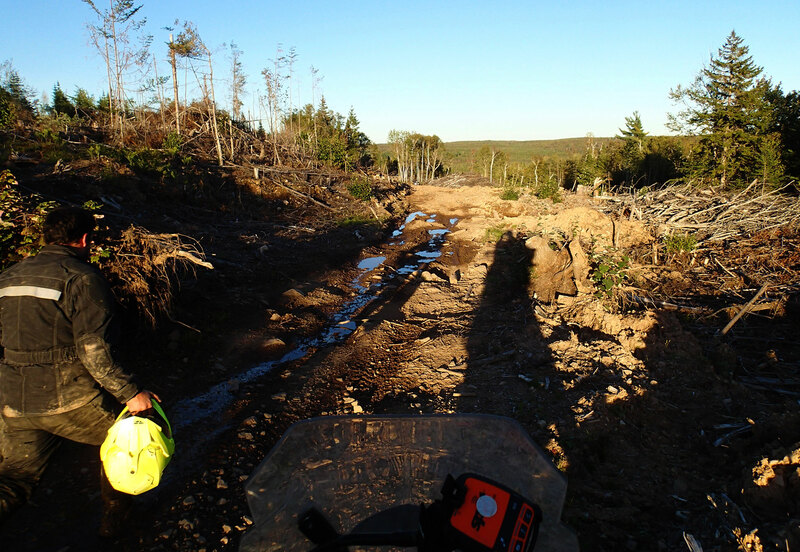 Clearcuts = big machinery = rough going. With the sun dropping out of view we cleared the last of the ruts and were soon back on the most welcomed pavement of rural New Brunswick, and then bang, up popped a fancy restaurant. Why you would build such a thing apparently in the middle of nowhere is a bit odd, but we had an appetite and they had food. I find I don’t usually get embarrassed any more but I did feel a little odd sat in a slightly upscale restaurant surrounded by well dressed diners. In comparison, we were two mud covered oiks that had emerged from the woods like some lost tribe of cavemen. We used our napkins to soak up the swamp water that was now draining off Charles and left a big tip to our accommodating and understanding servers (it is New Brunswick after all). We escaped the trail just before sun down. This area just north of Sussex, New Brunswick is one of my favourites and reminds me a lot of my Yorkshire ‘omeland. And that was the end to a perfectly adventurous day. The GS had performed pretty much as expected. An utter joy to behold in easy to moderate gravel trails and able to cope with the rougher stuff (though not ATV-only trails), if sometimes somewhat reluctantly. Pretty much as advertised. Job done at Chez Charles. 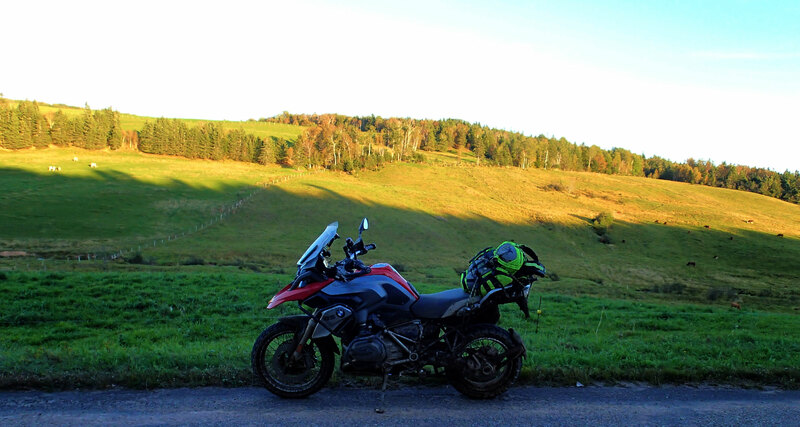 We think the GS looks great in the CMG autumn collection of mud, mud and more mud. It was a shame that the tires ultimately limited things, but it will be an important choice for the would-0be GS adventure rider. Go for the grip and burn through a set in a couple of outings, or compromise and tone down the adventure a bit? I think the latter is a realistic choice. It keeps the GS well inside its happy place — offering the rider maximum pleasure at minimal cost — as well as keeping the risk of seriously damaging the bike to minimum. That’s what I’d do anyway. And if I had the money for such a machine, then I’d likely also have the money for a Honda CRF250L as well. Between the two of them I’d have a bike that could not only tour all day long but also prove to be blast in the gravel, and another one that could pick its way through the unknown and come out the other side. It’s just a shame that now I have them, I’m going to have to hand them back. 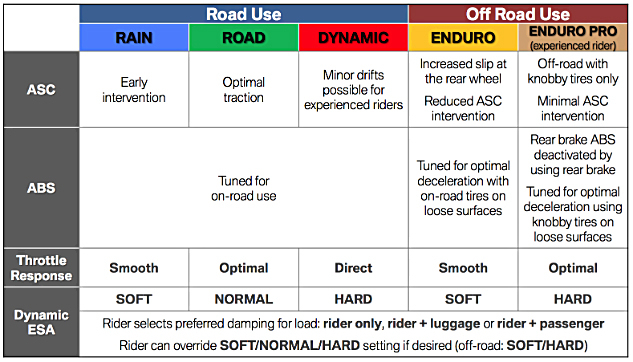 I don’t want to nit pick, but rider experience has a lot do with how a GS will perform. The rider was sitting most of the time, that is not the proper technique for riding a large adventure bike. I think if you were to read through the CMG archives, you’d see that Editor ‘Arris had enough experience on adventure bikes of all sizes to know which situations it was appropriate to stand on the pegs, or which situations to sit in. 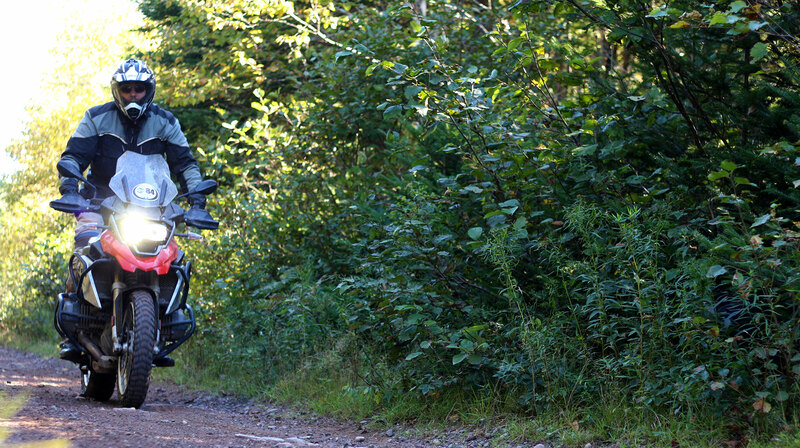 These big ‘Adventure’ bikes will get you into trouble a lot easier than they will get you out of it. I don’t understand the fascination with ‘Hardineau’ tires. Most likely because they’re cheap and last a long time. I recently tried a set of Anlas tires on my 650 Vstrom and they were just as good or better than TK 80’s. We did 5 sections of the Idaho BDR and those tires saved the day on more than one occasion. hahahahahahaha, oh that is good. We’ll just go right to that for future videos I think. 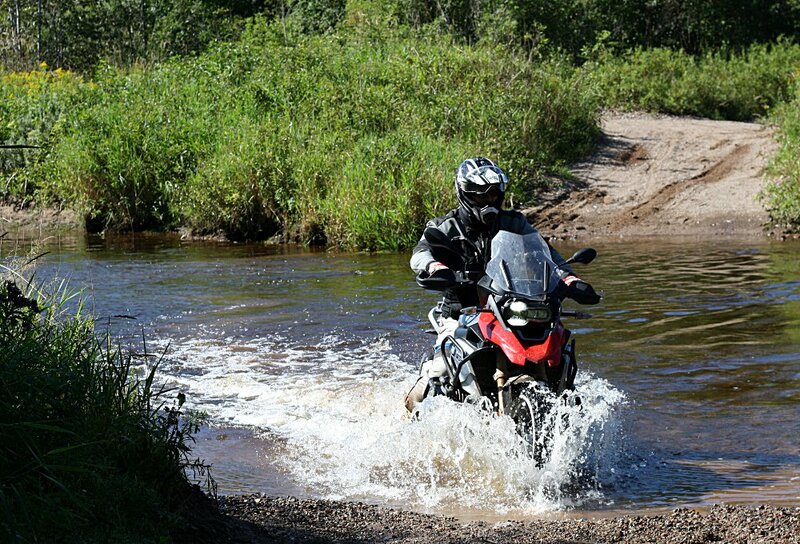 I just don’t see where the fun is in lugging a big beast like the GS through that kind of terrain. I guess if you’re some kind of masochist, or just want to be able to say you’ve done it… But I guess it’s good to know it can get through some tough terrain if that’s what lies between where you are now and where you want to be. If you’re lugging it, then yes, it grows thin pretty quick. But if you’re on decent flowing trails then it is blissful. As you said, lugging it through the rough sections to get to the bliss is something that it can mostly do and not an issue, but I wouldn’t go exploring down dark unknown trails on my own. 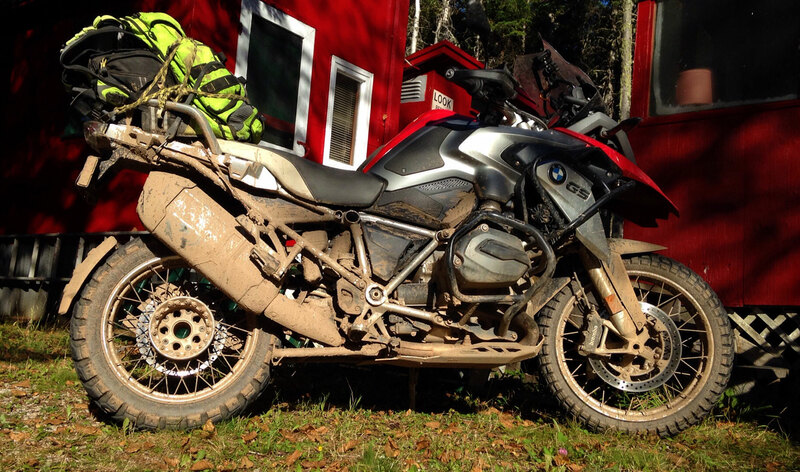 Seems to me that this is what the FAR is all about, big adventure bikes getting dirty! Great to see the Rallymaster taking the beast through some fun trails while keeping the ‘Minions’ busy post rally!